Objective: This study aims to investigate the clinical results of applying laser iridotomy to early primary angle-closure glaucoma. Method: One hundred forty-eight patients with early primary angle-closure glaucoma were selected as research subjects. They were divided into observation and control groups. Each group included 74 patients. The observation group underwent laser iridotomy treatment with mannitol and pilocarpine. The control group merely received mannitol therapy along with pilocarpine. Results were analyzed retrospectively. The effective rate of treatment and the levels of intraocular pressure and visual acuity after treatment in the two groups were compared. Results: The effective rate of treatment of the observation group (83.8%) was significantly higher than that of the control group (68.9%), and the intraocular pressure and visual acuity of the observation group (19.67 ± 2.37 and 0.7 ± 0.2, respectively) were much better than those of the control group (25.06 ± 1.67 and 0.4 ± 0.1, respectively). The difference was statistically significant (P<0.05). The gap in the anterior chamber angle of the treated patients significantly increased compared with that before treatment. 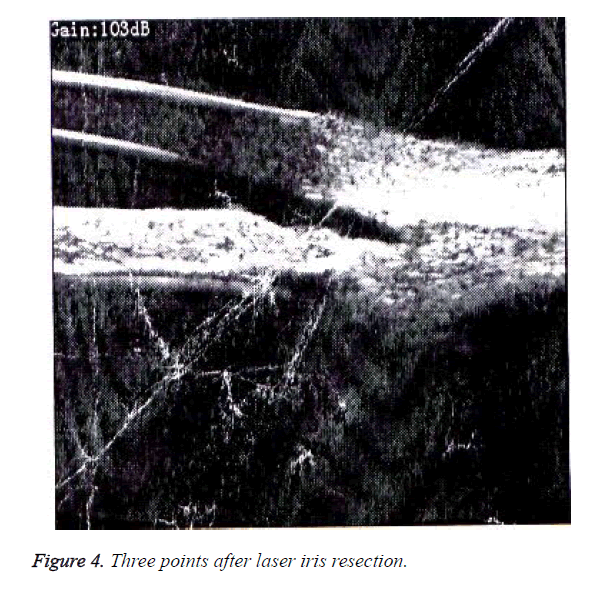 Conclusion: Laser iridotomy for the clinical treatment of early primary angle-closure glaucoma effectively reduces the intraocular pressure and improves the acuity level of patients; it also increases the gap in the anterior chamber angle. The effective rate of treatment is high, so the treatment improves the quality of life of patients. Therefore, this treatment can be popularized in clinical applications. Laser iridotomy, Early primary, Angle-closure glaucoma. Primary angle-closure glaucoma is an ophthalmic disease caused by the angle closure of the anterior chamber and water discharge, which is common in old people aged between 50 and 70. Mild cases show decreased visual acuity and intraocular pressure. For serious illness, the blindness rate is high. Thus, much inconvenience is caused. Currently, the common clinical treatments are drug therapy (mannitol with pilocarpine , nimodipine) and surgical treatment (laser iridectomy , ultrasonic phacoemulsification). To investigate the clinical results of applying laser iridotomy to early primary angle-closure glaucoma, we selected 148 patients with early primary angle-closure glaucoma as research subjects from March 2012 to December 2015. The results were analyzed retrospectively. The specific circumstances are shown below. We received 359 patients with early primary angle-closure glaucoma for treatment in our hospital’s Department of Ophthalmology from March 2012 to December 2015. We randomly selected 148 patients as the research objects. The diagnostic codes  were as follows: impaired vision, eye pain, increasing intraocular tension (more than 40 mmHg), corneal bedewing, corectasis, scleral atrophy, aqueous flare, scleral adhesion, and translucent white or milky white opaque spot in the anterior capsule of lens. For the inclusion criteria, the 148 patients in this study were all diagnosed with early primary angle-closure glaucoma; patients in other departments of ophthalmology disease or special disease interference were excluded after a comprehensive examination. All patients had no history of primary angle-closure glaucoma. For the exclusion criteria, patients with high blood pressure, high cholesterol level, heart disease, diabetes, and other diseases or have a low operative tolerance for mannitol and pilocarpine as well as laser iridotomy were not included. All patients were randomly divided into observation and control groups after obtaining the consent of the patients and their families. The observation group comprised 74 patients aged between 53 and 68 years. The control group also included 74 patients aged between 49 and 64 years. The patients in the two groups have the same course of disease (within 1 month), appropriate admission time, physical characteristic (eucrasia), education (junior high school degree or above), and home situation (wellto- do family). Therefore, they were comparable (P>0.05). Control group: We used pilocarpine eye drops (Wuhan Five King Pharmaceutical Co., Ltd.) and intravenous mannitol (Jiangsu Hengrui Pharmaceutical Limited by Share Ltd.) for patients. Two to three drops of pilocarpine eye drops were applied at an interval of 2-4 h. Mannitol (250 mL) was injected once daily at a controlled injection rate of 4-5 mL/min. Observation group: We adopted laser iridotomy  on the basis of the drug treatment in the control group. Preoperative patients were asked to follow the principle of water for a few times and avoid being in a dark environment for a long time. 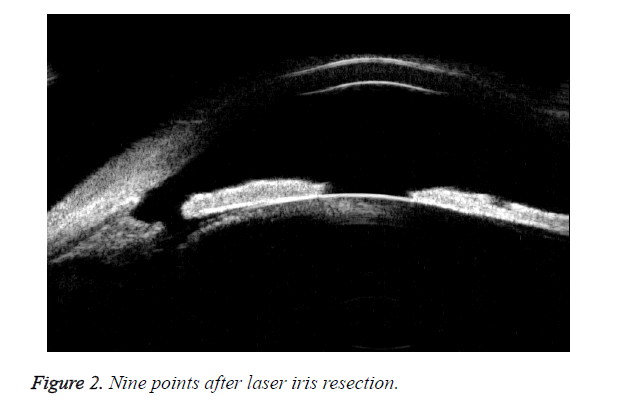 Nine points in the affected eye were reduced to three points near the periphery of the iris laser blasting pore (German Zeiss YAG laser burning consisted of three pulses, with an average energy of 15.2 mJ and an iris incision diameter of 1-2 mm. Through clinical observation, the treatment  of patients was divided into obviously effective, effective, and ineffective (obviously effective: eye discomfort was eliminated, and intraocular pressure and strength levels returned to normal; effective: intraocular pressure decreased and visual acuity improved, but a sense of discomfort remained; ineffective: after the treatment, the condition changed, but intraocular pressure and visual acuity were unchanged). The patients were told to measure intraocular pressure and visual acuity before and after the treatment. SPSS13.0 was utilized for the statistical analysis of data. Measurement data were expressed as mean ± standard deviation (͞x ± s). T test, counting the data by (n, %), and chi square test were utilized. P<0.05 meant that the difference was statistically significant. By comparing the effective treatment rates of the two groups of primary angle-closure glaucoma patients, we determined that the effective rate of treatment of the observation group was significantly higher than that of the control group. The difference was statistically significant (P<0.05), as shown in Table 1. Note: compared with CG, *P<0.05; aOG: Observation Group; CG: Control Group. Table 1. Comparison of the effective treatment rates of the two groups. The intraocular pressure and visual acuity of the patients were recorded before and after the treatment. The intraocular pressure and visual acuity of the observation group were much better than those of the control group. The difference was statistically significant (P<0.05), as shown in Table 2. Table 2. Comparison of the intraocular pressure and visual acuity of the two groups. The gap in the anterior chamber angles of the primary angleclosure glaucoma patients was compared before and after the treatment, as shown in Figures 1-4. The comparison showed that the anterior chamber angle space significantly increased, which is conducive to the exclusion of room water and the remission of the disease. Figure 1. Nine points before laser iris resection. Figure 2. Nine points after laser iris resection. Figure 3. Three points before laser iris resection. Figure 4. Three points after laser iris resection. 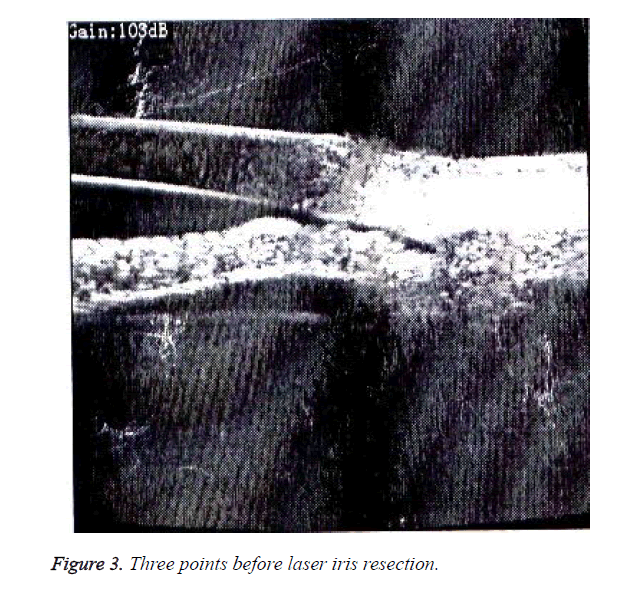 Laser iridotomy involves the use of a laser instrument with nine ocular points reduced to three near the periphery of the iris at the blasting pore, thus directly opening the anterior chamber angle, solving the problem of aqueous barrier discharges, and balancing the real pressure to restore the physiological aqueous humor drainage pathway. This method  is an effective means to cure primary angle-closure glaucoma and protect the visual function of patients. With the rapid development of medical technology, conventional drug treatment can no longer meet the needs and requirements of patients. Patients with diseases want rapid cure and require that the prognosis is good. Therefore, a scientific and effective treatment method is particularly important. Scientists have stated that  the operations of all patients are successful for one time, with no iris hole closure. The postoperative corneal endothelial cell count (2288.14 ± 394.01) and the preoperative one (2338.19 ± 362.54) have no statistically significant differences (P>0.05). However, the postoperative peripheral anterior chamber depth has significantly deepened (a total of 46 cases) compared with the preoperative one (P<0.05). Thus, the clinical results of applying laser iridotomy to early primary angle-closure glaucoma are obvious. The symptoms of patients are controlled, and the feasibility  of laser iridotomy, which can effectively improve the condition of patients, is accepted by patients and the society. In this study, the effective treatment rate of the observation group (83.8%) was significantly higher than that of the control group (68.9%). The intraocular pressure and visual acuity (19.67 ± 2.37 and 0.7 ± 0.2, respectively) of the former were significantly better than those of the latter (25.06 ± 1.67 and 0.4 ± 0.1, respectively). The difference was statistically significant (P<0.05). Laser iridotomy for the clinical treatment of early primary angle-closure glaucoma effectively reduces the intraocular pressure of patients, improves their acuity level, and increases the gap in the anterior chamber angle. The effective rate of the treatment is high, so the treatment improves the quality of life of patients. Therefore, this treatment can be popularized in clinical applications. Hamush N, Schakal A. Subhyaloid haemorrhage from proliferative diabetic retinopathy after Nd:YAG laser iridotomy. Brit J Ophthalmol 2000; 84: 1435-1440. Gazzard G, Friedman DS, Devereux JG, Chew P, Seah SKL. A prospective ultrasound biomicroscopy evaluation of changes in anterior segment morphology after laser iridotomy in asian eyes. Ophthalmology 2003; 110: 630-638. Kashiwagi K, Abe KS. Quantitative evaluation of changes in anterior segment biometry by peripheral laser iridotomy using newly developed scanning peripheral anterior chamber depth analyser. Brit J Ophthalmol, 2004; 88: 1036-1041. Caronia RM, Liebmann JM, Stegman Z, Sokol J, Ritch R. Increase in iris-lens contact after laser iridotomy for pupillary block angle closure. Am J Ophthalmol 1996; 122: 53-57. 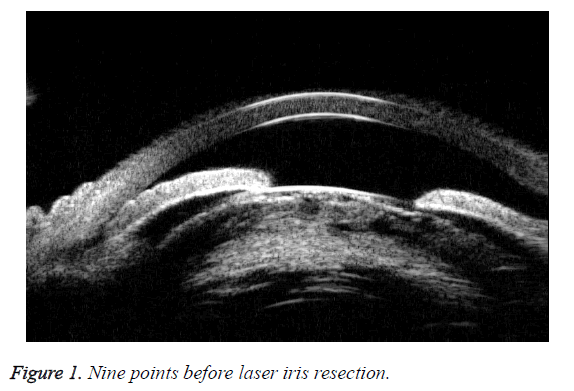 Mansouri K, Burgener ND, Bagnoud M, Shaarawy T. A prospective ultrasound biomicroscopy evaluation of changes in anterior segment morphology following laser iridotomy in European eyes. Eye 2009; 23: 2046-2051. Sung CJ, Yeon KY. Progression of peripheral anterior synechiae after laser iridotomy. Am J Ophthalmol 2005; 140: 1125-1127. Wu SC, Jeng S, Huang SC, Lin SM. Corneal endothelial damage after neodymium: YAG laser iridotomy. Ophthalmic Surg Las 2000; 31: 411-416. Er H, Doganay S, Evereklioglu C, Cekmen M, Daglioglu MC, Isci N. Effects of L-NAME and timolol on aqueous IL-1beta, IL-6, IL-8, TNF-alpha and NO levels after Nd:YAG laser iridotomy in rabbits. Eur J Ophthalmol 2002; 12: 281-286.